and restored your song of life and triumph. and to tell of the wonderful things you have done, through Jesus Christ our Lord. Amen. 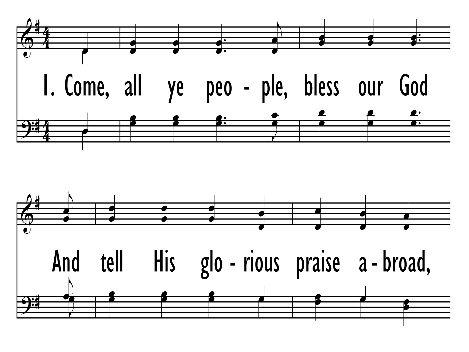 The 1912 Psalter was the first ecumenical psalter published in the United States and the most widely used metrical psalter of the twentieth century in North America. The United Presbyterian Church invited all other Reformed and Presbyterian denominations to join them in the effort to provide a new versifications of the psalms; six Presbyterian denominations, as well as the Christian Reformed Church and the Reformed Church in America joined in the effort in revising the 1887 Psalter (whose texts actually dated back to the 1871 Book of Psalms; the 1887 edition had added music to the texts.). The 1912 Psalter included all the psalms in 413 settings, eight doxologies, and the three Lukan canticles (Song of Mary, Song of Zechariah, and Song of Simeon). For the first seventeen years of his life Charles H. Gabriel (b. 1856; d. 1932) lived on an Iowa farm, where friends and neighbors often gathered to sing. Gabriel accompanied them on the family reed organ he had taught himself to play. At the age of sixteen he began teaching singing in schools (following in his father's footsteps) and soon was acclaimed as a fine teacher and composer. He moved to California in 1887 and served as Sunday school music director at the Grace Methodist Church in San Francisco. After moving to Chicago in 1892, Gabriel edited numerous collections of anthems, cantatas, and a large number of songbooks for the Homer Rodeheaver, Hope, and E. O. Excell publishing companies. He composed hundreds of tunes and texts, at times using pseudonyms such as Charlotte G. Homer. The total number of his compositions is estimated at about seven thousand. Gabriel's gospel songs became widely circulated through the Billy Sunday­-Homer Rodeheaver urban crusades.